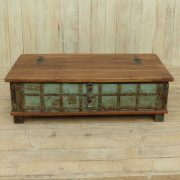 Reclaimed wooden carved front small storage box on tall legs. With its beautifully hand carved frontage and muted yet colourful finish, this charming piece can work as a bedside or end table. The lid of this solid wood piece opens on a hinge, revealing a generous amount of storage within, and also has a lockable clasp should you need extra protection for your valuables.